Last week, on June 23, the Class of 2017 graduated from Hudson High School. 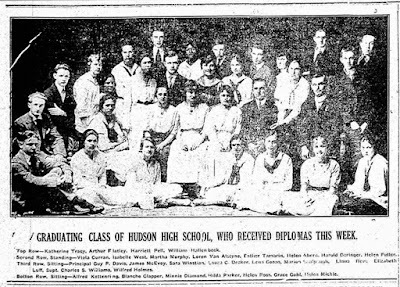 On June 26, 1917, a picture of that year's Hudson High School graduating class appeared in the Hudson Evening Register. The picture includes not only the graduates--10 young men and 19 young women--but also the high school principal, Guy P. Davis, and the superintendent of schools, Charles S. Williams. The building in which these students would have spent their senior year and the second half of their junior year was 401 State Street. 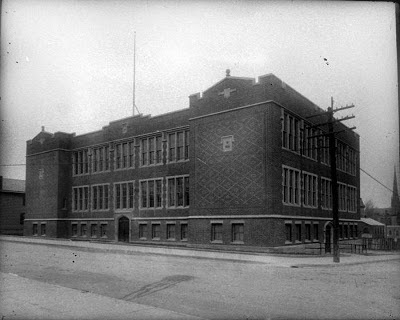 Completed in 1915 and dedicated on January 4, 1916, the building was considered the epitome of all that was desirable in a school building, "constructed and equipped according to the most modern ideas." 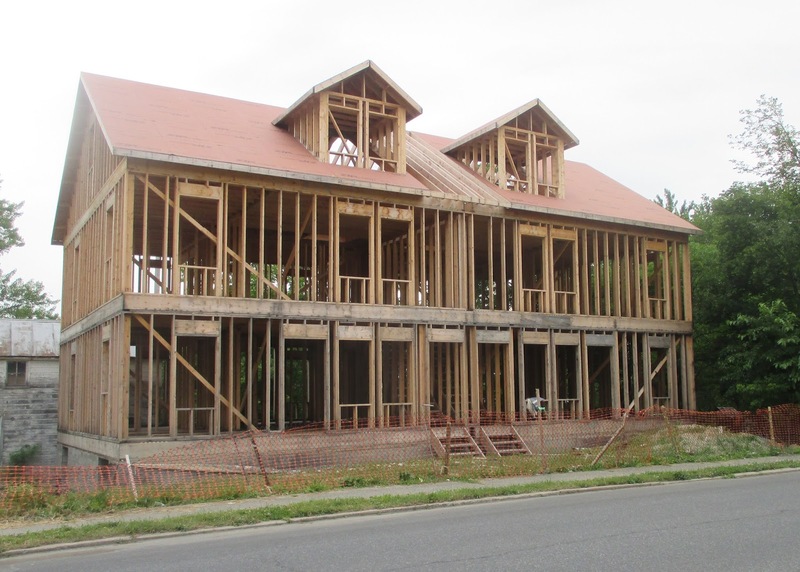 In the summer of 2014, a proposal to construct a four-unit apartment building at the corner of Fairview Avenue and Bayley Boulevard got its required variances from the Zoning Board of Appeals and received site plan approval from the Planning Board. Over the past three years, construction of the building has proceeded in fits and starts, much to the vexation of some who live in close proximity to the site. In the dead of this past winter, the building was finally framed out, but, for the past few months, in the height of the construction season, no progress has been made. It is now rumored that the Galvan Foundation has purchased the partially constructed building. That should ensure its speedy completion. 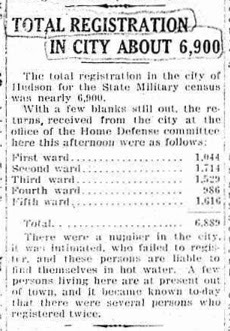 The New York State Military Census took place between June 11 and June 25, 1917. Everyone between the ages of 16 and 50—women as well as men—was required to register in the census, which was undertaken to identify the resources in the state that could be tapped for the war effort. 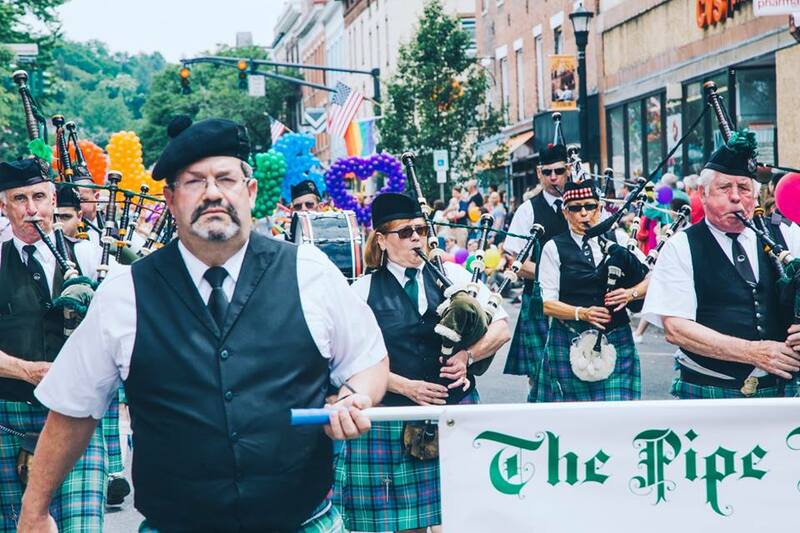 On June 26, the Hudson Evening Register announced the results for Hudson. 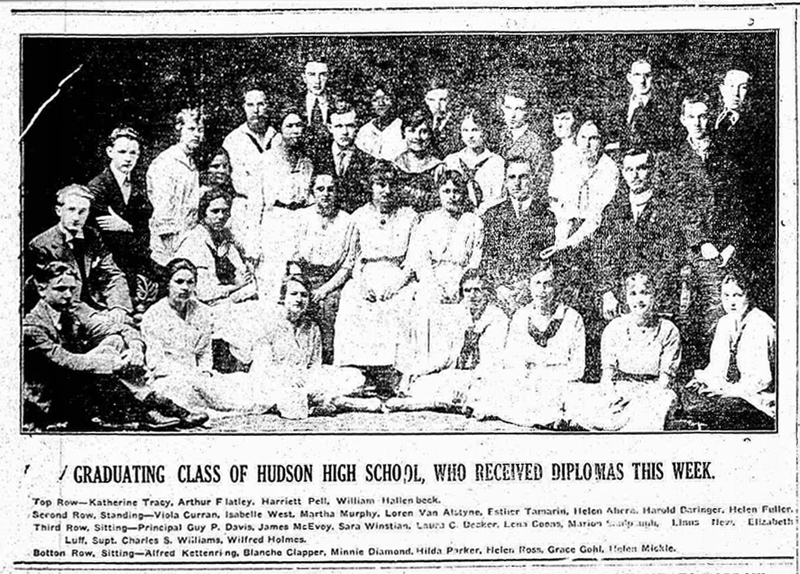 Of interest to us today is that the number of Hudsonians between the ages of 16 and 50 in 1917 is greater than the entire population of Hudson today. The only ward in which the total population at the end of the first decade of the twenty-first century was greater than the number of people in the ward between the ages of 16 and 50 in 1917 was the Fifth Ward. 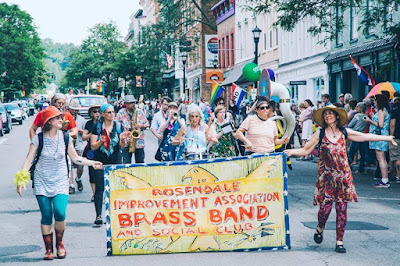 After compiling a list of 998 mid-sized cities, we researched the walkability of each city, and then ranked them by the number of antique shops, restaurants, and hotels. We also gathered the date each city was founded because history definitely adds to the charm factor. The following ten cities have a walk score of 80 or higher, meaning you can easily park your car and spend the rest of your day perusing the many antique shops on foot. That being the criteria for charm, Hudson made the list: "The 10 Most Charming Cities in America." It's pretty clear that the creators of the list never set foot in Hudson or any of the other nine cities on the list--at least not in the course of researching the article. The picture used of Hudson is one we've seen many times before. (It's the one that appears on Wikipedia.) It's so old it still shows the old Urban Renewal era lamp posts which were replaced in 2009 by the ones we have now. The first troops from the United States arrived in France on June 26, 1917. 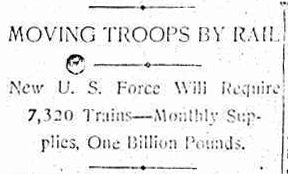 On the day before, a lengthy article appeared in the Hudson Evening Register describing the challenges of transporting troops from all across the country to France. 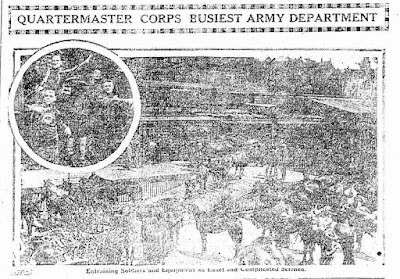 The Quartermaster Corps is just now the busiest department of the United States Army. 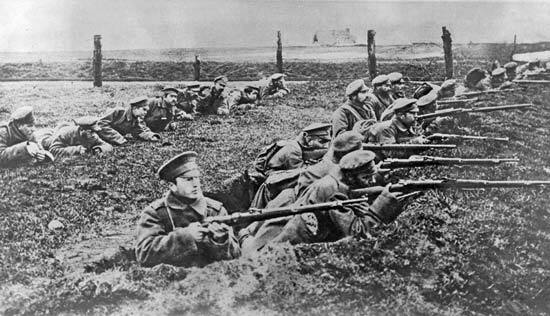 Without it not a single company of troops could reach the firing line, not a soldier clothed, fed or armed. To move the great army Uncle Sam is bringing into being means the marshalling of 121,580 railroad cars in 7,320 trains and directing them without delay or confusion over routes many of them over three thousand miles long. To keep this force provisioned in the field means supplying and shipping one billion pounds of freight a month, requiring fifty-five trains a day. The Quartermaster Corps, in cooperation with Defense Committee of railroad presidents, has organized America's 260,000 miles of railroad, with its hundreds of corporations, into one system and plotted every mile and every train move over its myriad routes…. 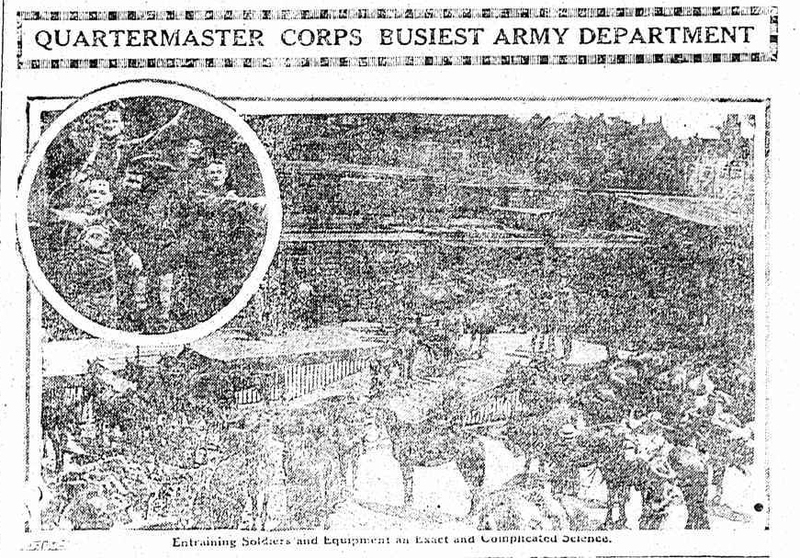 Quartermaster Corps officers must know every stopping point, length of sidings, junctions, capacity of terminals, loading and unloading facilities, size of tunnels, capacity of bridges, &c., along their routes. The estimates of the corps are based on a force of twenty field armies, or about 1,500,000 men. 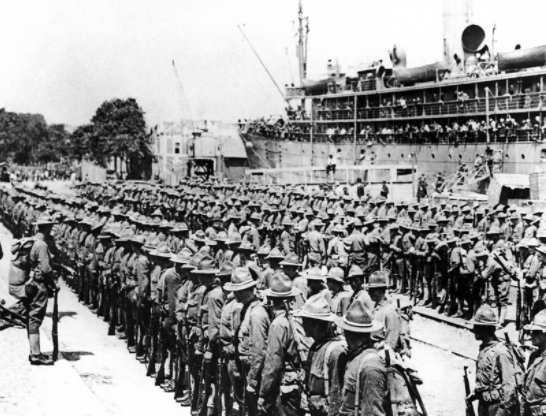 With them go 700,000 mount and draught animals, 60,000 vehicles and 3,360 big guns. A tabulation of rolling stock and other railroad equipment just completed shows that to handle this traffic there are needed, besides more heavy cars, special terminal yards and sidings, loading and unloading platforms, double tracking of many single track lines and the building of new lines into undeveloped territory. This means the raising of a vast amount of new capital by the railroads. The railroad executives believe that the systematizing and unifying of railroad control under federal authority, brought about by war preparation, will prove the value of such centralized regulation for permanent adoption by the United States as a peace measure. This vast increase of expense is putting the roads in shape for war is also given as one of the chief reasons for asking the Interstate Commerce Commission for permission to increase freight rates. 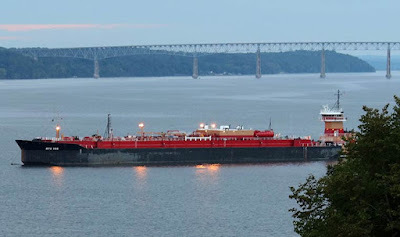 There is news about the commercial ship anchorages proposed last year for the Hudson River. The proposal was for forty-three berths in ten locations between Yonkers and Kingston. Today, the U.S. Coast Guard announced that it will conduct a Ports and Waterways Safety Assessment (PAWSA) of the Hudson River. The news release from the Coast Guard explains: "The PAWSA process is a disciplined approach to identify major waterway safety hazards, estimate risk levels, evaluate potential mitigation measures, and set the stage for implementation of selected measures to reduce risk." The news release continues: "In the fall, a group of waterway users and stakeholders will conduct a two-day structured workshop to meet these objectives and ensure the PAWSA process is a joint effort involving waterway users, stakeholders, and agencies to determine the safety of the waterway." Today’s announcement by the Coast Guard is terrific news for the Hudson River and the countless community members, businesses, organizations, and elected officials--of both parties--who opposed the anchorages proposal. It brings welcome relief from the threat of increased petroleum traffic and potential oil spills that new anchorage grounds would inevitably bring. My office has spoken out against this plan since it was first introduced, and I’m proud of our recently passed legislation that increases the state’s capacity to protect communities and natural habitats along the Hudson River. Often referred to as America’s River, the Hudson is the lifeline of our region: It connects us economically, culturally, and historically. 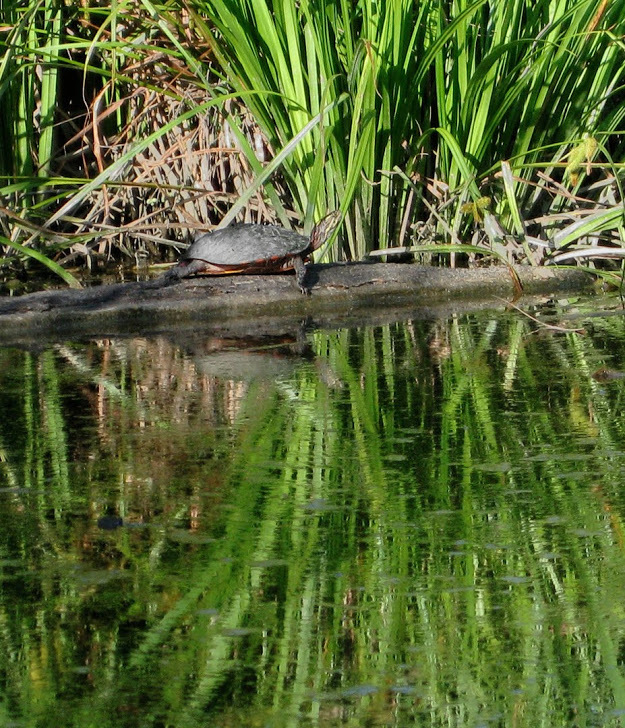 We remain committed to fighting for a healthy, safe, and vital Hudson River, today and for future generations. 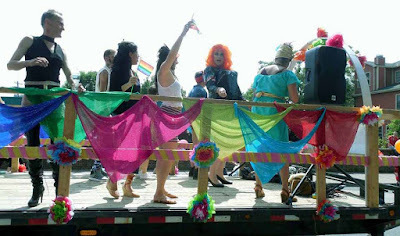 Bill Williams of 98.5TheCat just shared this news: "Another Hudson Mayoral candidate arrested." The mayoral candidate arrested today, for allegedly making "a terroristic threat" and aggravated harassment, is Fred Starke (at right). 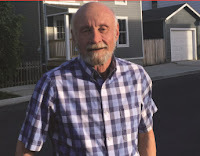 Two weeks ago, another mayoral hopeful Earl Swanigan was arrested for allegedly entering a house without permission and touching a woman inappropriately in the course of trying to get her to sign his designating petition. Last night, the Greenport Planning Board continued its review of the proposed Colarusso haul road. The board is still gathering information in preparation for making a positive or negative declaration in the SEQR process. P. J. Prendergast, engineer for Colarusso, told the Greenport Planning Board, as he did the Hudson Planning Board a few weeks earlier, that to solve the problem of dust, they were going to pave the roadway through South Bay, and they would also pave the 200 feet from the end of the haul road to the southern end of Front Street. 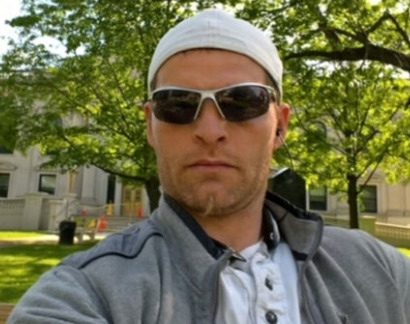 He asserted that the environmental consultants for Colarusso said "paving was a good idea." 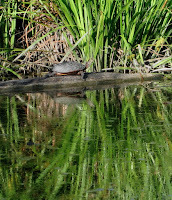 Those consultants apparently also suggested that a 15 mph speed limit be imposed on the haul road and that signs be erected to warn drivers not to run over snakes and turtles in the road, although Prendergast claimed the drivers would never run over a turtle. "They would stop the truck and hustle it out of the way." 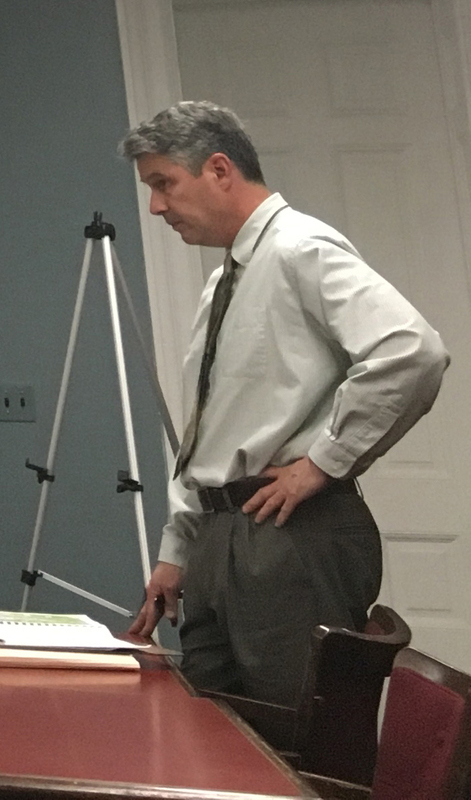 Planning Board chair Ed Stiffler asked if the proposal to pave the road had been presented to the Department of Environmental Conservation (DEC). Prendergast confirmed that it had, saying there were "other people who have to look at it" but making the prediction that "they will think it's OK." He then declared: "If DEC says don't pave it, they're [i.e. Colarusso] OK with that; if DEC says pave it, they're OK with that." Stiffler indicated that the board needed something in writing from DEC.
Ray Jurkowski, consulting engineer to the Greenport Planning Board, said that Trish Gabriel, the environmental analyst at DEC for our region, was drafting a letter in response to his correspondence, which he said "had to do with environmental issues, to assist the Planning Board in its SEQR determination." One of those environmental issues it seems were wetland grasses, about which Prendergast declared, "You can't kill wetland grasses; you can't even burn it." He went on to declare, "Anything they do will be an environmental improvement." There were also unanswered questions about the volume of traffic on the haul road and the perceived intensification in recent years of industrial activity on the haul road and at the dock. Prendergast maintained that the increase of activity had to do with the recovery after the Great Recession, and it was not a trend that was expected to continue. Jurkowski reminded Prendergast that this information needed to be documented in writing. It was decided that the letter from DEC was a critical component, as was Colarusso's written response about traffic. He then asked about the floodplain permit. Prendergast acknowledged that they hadn't received it yet, noting that Hudson Development Corporation, which must issue the permit, "hasn't done a floodplain permit since 1982," when the L&B building was constructed. It was decided that the board would hold a special meeting when the letter from DEC had been received. That meeting was tentatively scheduled for Tuesday, July 11, at 6:30 p.m. Although the next step seems to be for the board to decide if they will make a positive or negative declaration, Stiffler stated that the board "will not be making a formal determination" at that meeting. 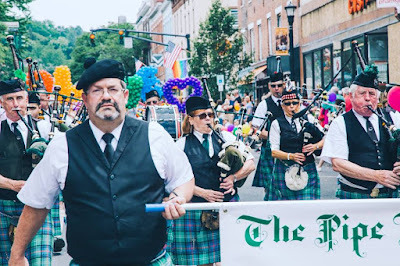 A formal determination, said Stiffler, will be done only after the board's legal council has drafted a resolution making the declaration, and the board votes on it. Two days after the Greenport Planning Board special meeting, the Hudson Planning Board is holding a public hearing on the alterations already completed at the dock. That hearing will take place on Thursday, July 13, at 6:30 p.m., at City Hall. Bill Krattinger, from the Office of Parks, Recreation, and Historic Preservation, is expected to visit the site of the Furgary Boat Club on Thursday, July 6. After that visit, he will meet with the mayor and members of the Common Council at 4 p.m. at City Hall, to discuss the possibility of pursuing state and national register designation for the site. 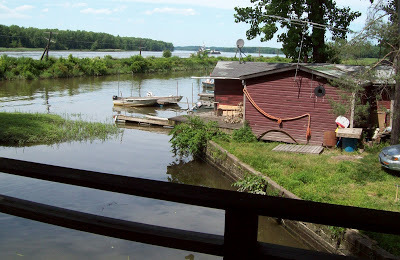 It was determined two years ago, at the end of July 2015, that the settlement of shacks known as the Furgary was eligible for listing in the National Register of Historic Places, not because the shacks are examples of great historic architecture but because the site in its entirety--shacks and their setting--is an example of a Maritime Cultural Landscape. 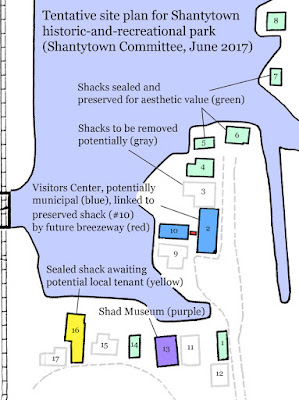 In the meantime, advocates for the Furgary, calling themselves the Shantytown Committee, have created a map to show what a plan for preserving the site might look like, which Gossips shares here, with the permission of its creators. 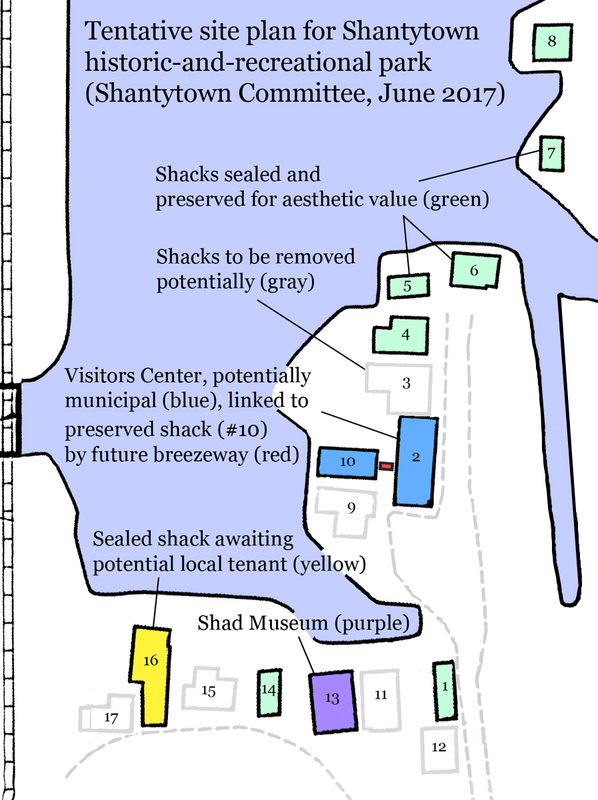 If you are curious to know which shacks are being recommended for preservation, you could go down and have a look. The numbers are spray-painted on the buildings, and the site is accessible. Any Day Now . . . 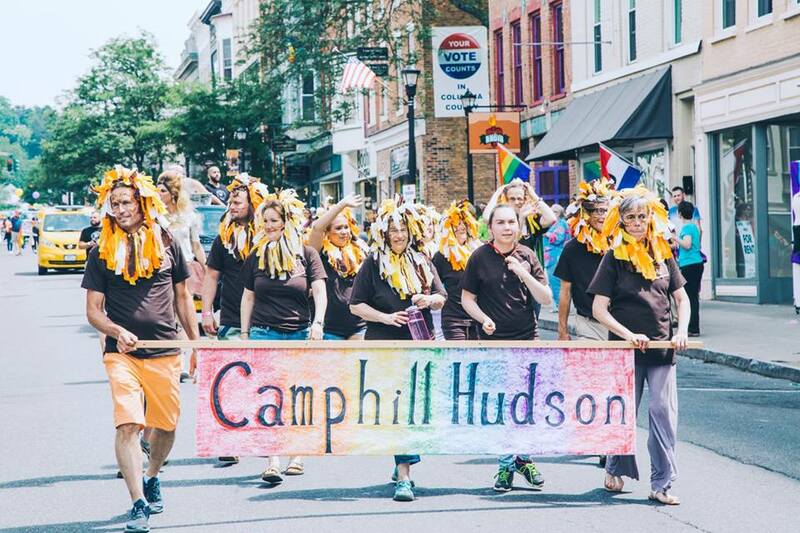 In April 2016, the Common Council passed a resolution allocating $4,230 to redevelop the City of Hudson website. In May 2016, the Council passed a resolution authorizing the mayor to enter into a contract with Revize, LLC, to do the work. The contract was for four years: the City would pay Revize, each year on March 29, $4,230 in the first and second years and $1,200 in the third and fourth years. It was anticipated that the work take a matter of months, but it's been more than a year, and there's still no new website. Last week, however, Gossips learned from the mayor that all the content from the current website had been migrated to the new website. This week, city officials are engaged in webinars to learn how to use the new website. So it appears that any day now the new website will go live, and when you enter cityofhudson.org, you will see something altogether new. 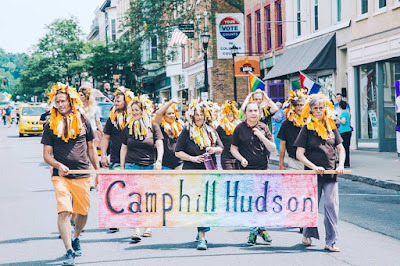 Most Hudson residents, although they have chosen to live in a compact, walkable urban setting, value the preserved open spaces and working farms that surround the city. 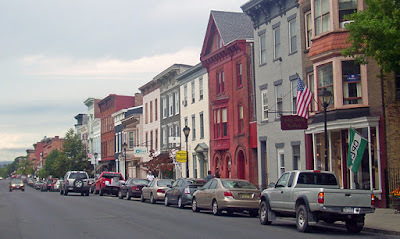 Even given its proximity to New York City and Albany, Columbia County has so far been spared, in large part, the kind of urban sprawl that destroys rural character and creates what James Howard Kunstler called "the geography of nowhere." 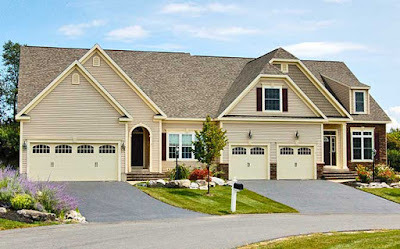 Recently, however, a new development has been proposed for the Town of Claverack, near the intersection of routes 9H and 66, in an area that has the 12534 zip code, that seems to be the complete antithesis of all that is valued about this place where we live. So far, the plan is for senior housing in one complex with both market value and government subsidized units. Another complex would have market value apartment units with some recreational amenities, while across 9H there would be a large commercial area for big box stores, warehouses, office space and whatever other commercial endeavors could be induced to locate there. Elsewhere, the proposed development has been described as "an $80 million, 700-unit apartment complex and big box commercial development that will be just south of 66." Amedore Homes has previously built developments in Albany, Saratoga, and Schenectady counties. The current zoning code in the Town of Claverack does not permit such a development, but it seems the Town Board is contemplating amending the zoning to allow the project to go forward. A Facebook group has been formed to share information this proposal. The First Annual OutHudson Parade Awards Ceremony happened tonight, and a week and two days after the spectacular OutHudson Pride Parade, Gossips is now able to announce the winners, chosen by the team of judges: Tiffany Martin Hamilton, Richelle Martin, and Rick Rector. There were also awards in categories other than the original eight. The award for Best Dressed Business went to Wm. 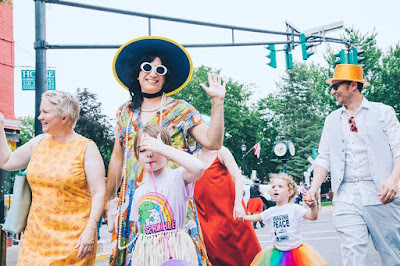 Farmer & Sons, and a Lifetime Achievement Award went to Lisa Durfee, who in every Pride Parade in Hudson except the most recent one has created a rainbow of vintage dresses from her shop, Five & Diamond. 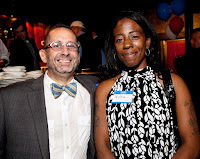 Last Tuesday, Victor Mendolia gave an hour of air time on his show @Issue on WGXC to Stephen Dunn, one of the two people vying to be the Democratic candidate for Common Council president. That interview has been archived and can be heard here. In the interview, Dunn talks at some length about his plans for improving the effectiveness of city government. One of his ideas, to appoint private citizens to work with the aldermen on Common Council committees, has a familiar ring to it. His opponent for the Democratic nomination, Tom DePietro suggested the same thing when he ran for Common Council president in 2015. 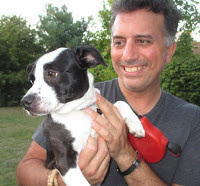 Meanwhile, Gossips has learned that WGXC will give DePietro equal time to discuss his platform on air before the primary on September 12. 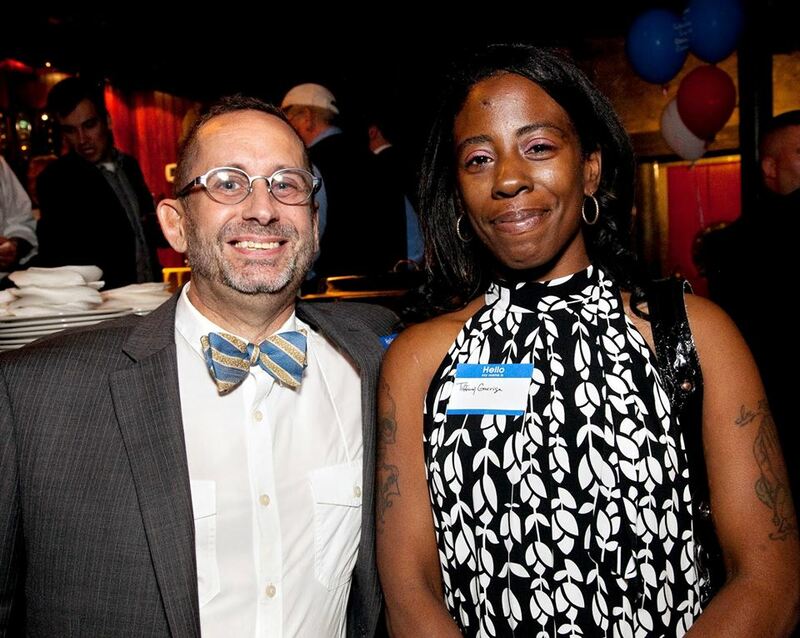 DePietro, who will be seeking the Democratic nomination in the primary, has already been endorsed by the Republicans and the Working Families Party. It appears the local election this year will be Democrats challenging Democrats. The Republicans seem to be putting up no candidates of their own, choosing instead to endorse Democratic candidates. So far it's been confirmed that the Republicans have endorsed Rick Rector for mayor and Tom DePietro for Common Council president. During the early days of the United States' involvement in the Great War, accounts of doctors offering their service to the war effort were no doubt common. 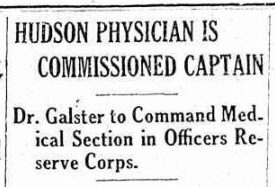 This report of a Hudson doctor being commissioned, however, caught my eye, because Henry C. Galster is a familiar character in Gossips posts. We know he made it safely through the war because in 1922, when Hudson police chief John J. Cruise was being investigated, accused, and tried for dereliction of duty, for allowing the production and sale of liquor to continue in Hudson in the early days of Prohibiton, Henry C. Galster was the mayor of Hudson. Dr. Henry C. Galster, as well known physician and surgeon of this city, to-day received a commission as captain in the medical section of the Officers Reserve corps of the United States army. He is now awaiting orders to leave Hudson for some concentration camp, from which he probably will be detailed to Europe. 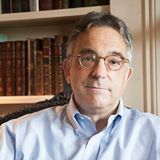 In April Dr. Galster offered his services to the United States government, and stated that he was ready for immediate service in Europe. He was recommended for a captaincy commission, but subsequently received word that led him to believe that he would be appointed a first lieutenant. This morning he received a communication from the office of the secretary of War, in which was his commission as captain in the medical section of the Officers' Reserve corps, which commission became effective June 15. His many friends will be delighted to learn of the designation and that he will make a most capable officer is not doubted. Dr. Galster for some time was first lieutenant in the Medical corps of the Tenth regiment, National Guard, a position he filled in a most capable manner. He has, therefore, considerable military experience. 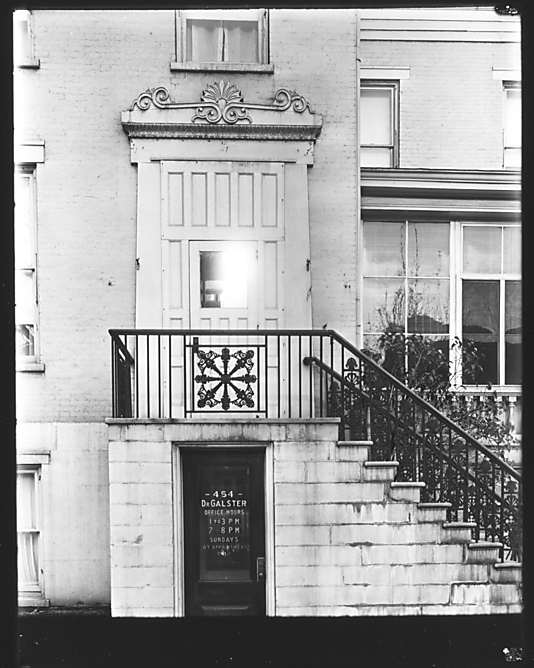 Galster, who was 29 in 1917, lived and practiced medicine at 454 Warren Street. It is the address given on his draft registration card. The picture below, by Walker Evans, shows the house, which is now the location of Nolita, as it was in the 1930s. 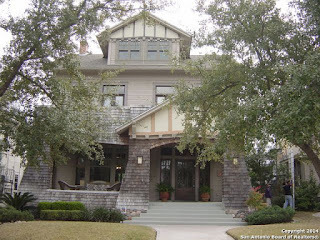 Galster's shingle can be seen on the street level door. 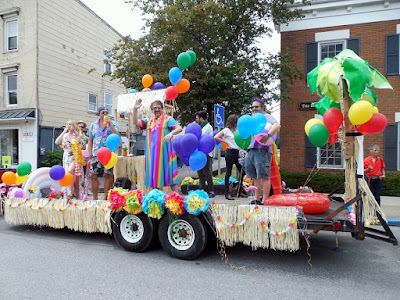 Ordinarily, Gossips doesn't pay much attention to Greenport politics (this is, after all, a blog about Hudson), but a recent event gives rise to curiosity. 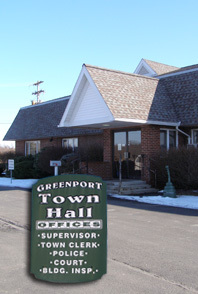 On Thursday, June 22, the Greenport Democratic Committee held a caucus to nominate its candidates to run for town office in November. 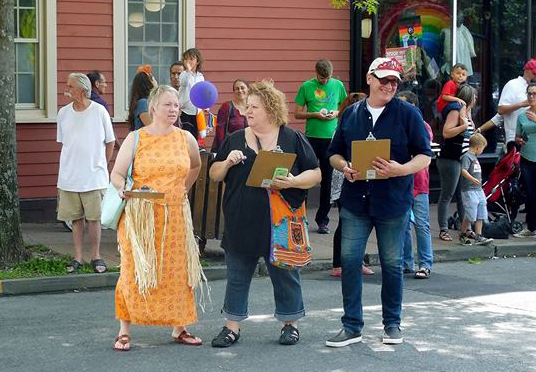 All registered Democrats living in Greenport were invited to come to the caucus and vote for the would-be candidates of their choice. 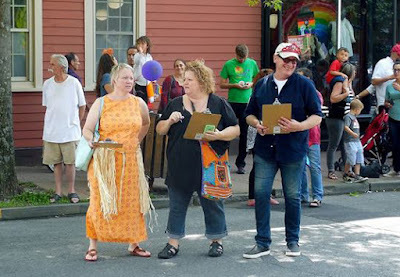 Yesterday, on the Democrats' blog, Thoughts on Greenport: Hanging Around Hudson, the Democrats announced their candidates: Kathy Eldridge for town supervisor; Janice Brodowski and Carol Peckham for town council; Mark Gaylord for town highway superintendent; and John Porreca for town justice. It's the last nomination that's puzzling. Gossips has learned that the Democrats had a choice for town justice between Porreca and Robert Gagen. The question arises: Why would they opt for a Republican who has no particular qualifications to be town justice over a Democrat who is a lawyer? 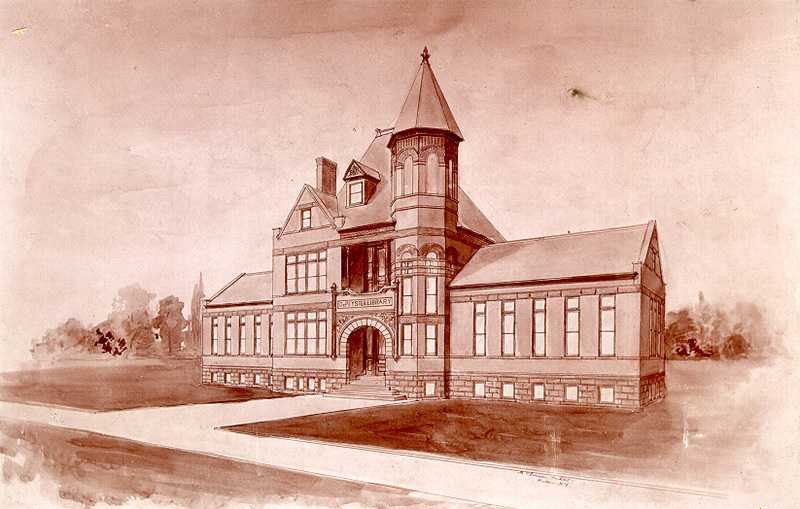 In the post on Thursday about Frederick Law Olmsted and his comment about Promenade Hill, I mentioned that the first library at Franklin & Marshall College in Lancaster, Pennsylvania, had been designed by Hudson architect Michael J. O'Connor and promised more on that subject. Today is the day to make good on that promise. The story starts with General John Watts De Peyster, the last patroon of Lower Claverack Manor and the great-great-great-grandson of Abraham De Peyster, who was mayor of New York in the 1690s. 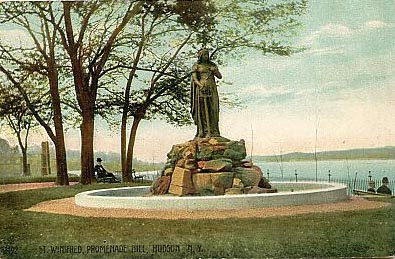 We in Hudson know De Peyster as the philanthropist who gave us the statue of St. Winifred by George Edwin Bissell that stands on Promenade Hill. From The Hudson Valley Sketchbook, "a fragmented history of the area by Mrs. Marion C. Smith of Hudson," which was self-published in 1964, we learn that De Peyster, who lived in Tivoli, and Michael O'Connor were personal friends. O'Connor played a role in getting De Peyster to donate the statue to Hudson 1896, when it turned out it couldn't be placed where De Peyster had intended it to go. 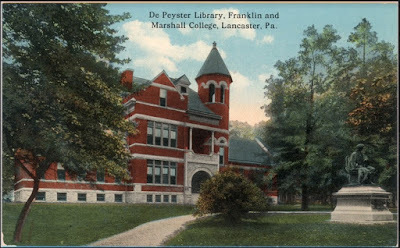 A few years later, when De Peyster decided to build a library for Franklin & Marshall College in Lancaster, Pennsylvania (the college had honored him as an amateur historian), he commissioned his friend Michael O'Connor to design the building. 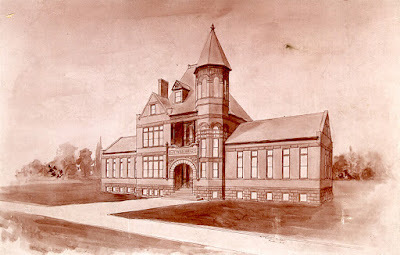 The pictures below show the library designed by O'Connor, which was dedicated in 1898. Sad to say, the De Peyster Library at Franklin & Marshall College was demolished in 1937. 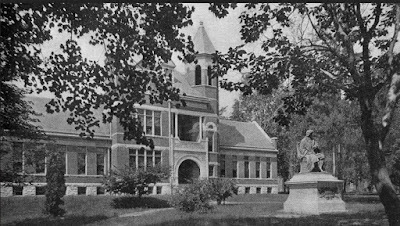 The colorized post card and the photograph above it both show a statue positioned in front of the library. That statue has its own story, one that was told in 2011 in the New York Times. In 1893, John Watts De Peyster commissioned Bissell to create a larger than life likeness of his great-great-great-grandfather, Abraham De Peyster. The intention was that the statue be placed in Battery Park. The New York Times complained at the time that "the Battery was already overrun with statuary." 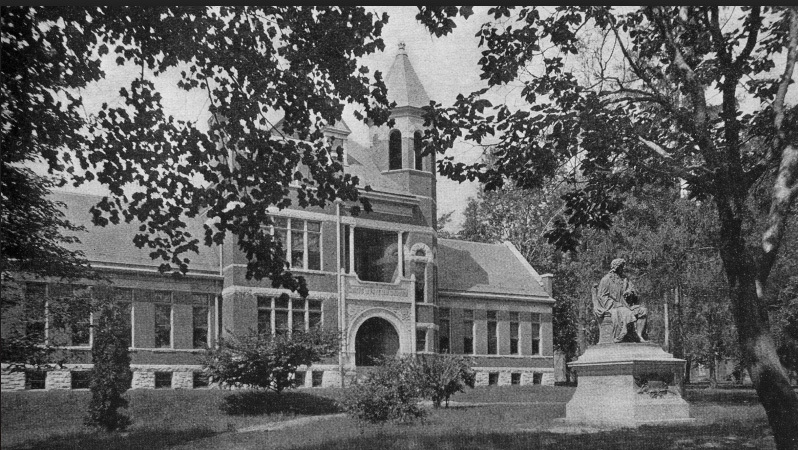 Growing weary of arguing with city officials about the placement of the statue, De Peyster offered it to Franklin & Marshall College, where presumably it was gratefully accepted, but when his dispute with the City of New York was resolved and the statue was placed in Bowling Green, a duplicate was cast and placed in front of the De Peyster Library. 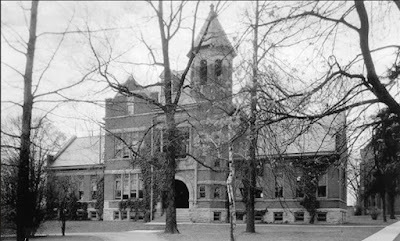 When the De Peyster Library was demolished in 1937, the statue was moved to a place of little prominence on the edge of the F&M campus. 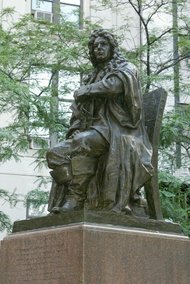 The statue in New York also suffered the indignities of being moved about--from Bowling Green to Hanover Square to a parks department warehouse on Randalls Island where it remained from 2003 until 2014, when it was installed and rededicated in Thomas Paine Park in Foley Square, at the corner of Lafayette and Worth streets. Columbia-Greene Media has announced that on Thursday, June 29, it will debut its "all-encompassing news website" called HudsonValley360. 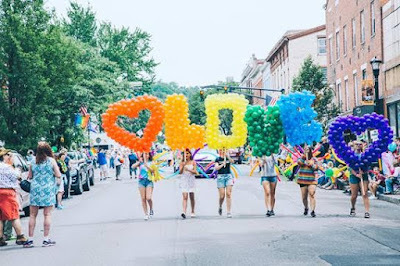 Mark Vinciguerra, publisher of Columbia-Greene Media, said of the new website: "HudsonValley360.com is a clean, well-designed website using the latest technology. We're the second newspaper in the world to go live on this completely new [Drupal] platform. It's got the ability to do more, it has quicker load times, it has a better look--as far as cleaner look, its features include video and photo galleries that load faster and look crisper. For us, that means we're going to tell stories in a different way. It allows us to do more multimedia storytelling." Vinciguerra continues, "We are taking a more regional approach to our coverage. The idea is to expand our audience, which, right now, is 200,000-plus unique visitors, consuming over 1.2 million pages per month. 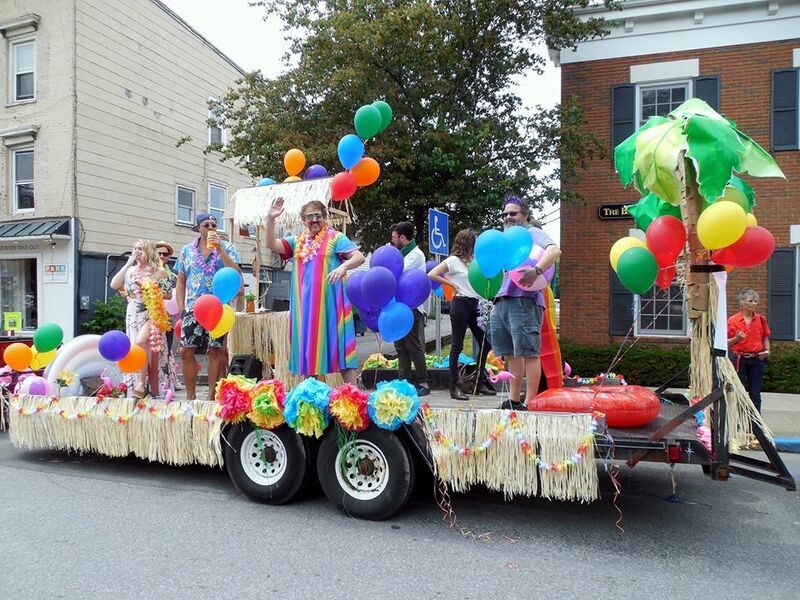 We're the biggest media entity in the Twin Counties and HudsonValley360.com will help us expand on that." 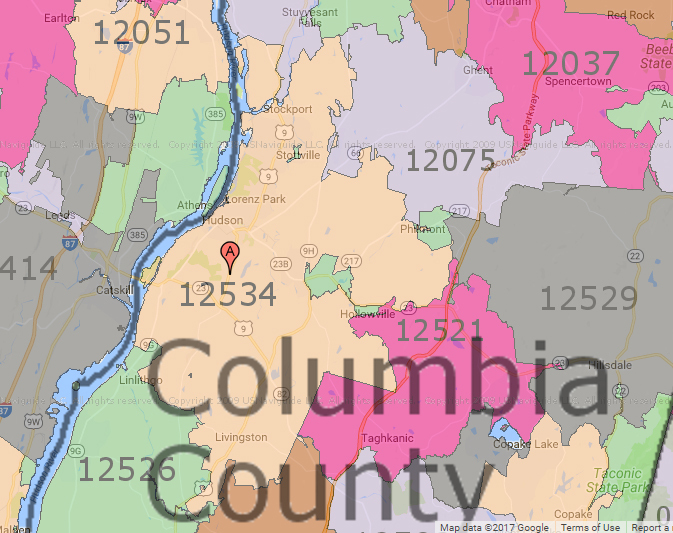 Interestingly, in 2014, the population of Columbia County was 62,122 and population of Greene County was 47,967. Everyone is eager to know who will be walking away with the prizes, but if you're more serious-minded and worried about your health insurance and how the Trump era American Health Care Act (AHCA) would impact you, you might want to go to the Hudson Opera House at 6 p.m. before joining the party at Helsinki. It is predicted that the AHCA, if passed, will leave 2.7 million New Yorkers without health insurance and will roll back protections for women, children, and people with preexisting conditions. The prediction continues: "The AHCA would include $7 billion in cuts from New York's healthcare system--effectively eliminating the Essential Plan, devastating our hospitals, and forcing major staffing cuts during a time when we need more, not less, doctors and nurses." Monday evening at the Hudson Opera House, an expert panel will talk about the AHCA and give you the opportunity to learn what is at stake and how best to protect your family from possible changes to our health care system. If you plan to attend the forum on Monday, June 26, at 6 p.m., at the Hudson Opera House, you are asked to RSVP to mike.morris@exec.ny.gov. Mike Morris is the representative from the governor's office for the Capital Region. The war in Europe and woman suffrage were both in the news in 1917. The most compelling story in the Hudson Evening Register for June 22, 1917, weaves together the themes of patriotism and service with women's liberation. Miss Helen M. Hall, daughter of Judge and Mrs. M. M. Hall of this city, has the distinction of being the first woman to apply for entrance into the government Aviation schools. A week ago Miss Hall offered her services to Captain Davidson of the Cornell Aviation school. The course is for eight weeks, after which the students are transferred to another government school to get practical experience in flying. Upon finishing at these schools, students are given commissions as Lieutenants, Captains or Majors. As yet no provisions have been made for women in the Signal corp so that immediate entrance to impossible. The War department at Washington, however, has assured Miss Hall that such provisions will be made within the next few months and that the county will be glad to welcome her as the first aviatrix in the government schools. Miss Hall, while waiting for the government to take action, is at present engaged in organizing a Cornell Women's Ambulance corps for immediate service in France. A week later, there was more news about Miss Hall on the front page of the Register. Miss Helen M. Hall, daughter of former City Judge and Mrs. Milton M. Hall of this city, returned home yesterday from Cornell university. She was graduated from that institution on Wednesday, receiving the degree of A.B. Miss Hall will remain here for a week, and will then return Ithaca, where she has an excellent position. 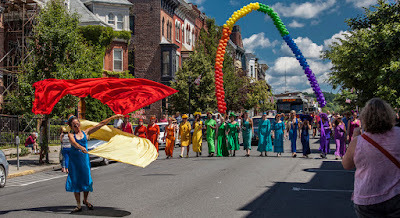 The commencement exercises at Cornell this year, Miss Hall states, were not as impressive as in former years because of the fact that a large number of the seniors are in the United States service and many are now in France. Those who were graduated were sent telegrams to the effect that they had been graduated. Miss Hall has been very much interested in aviation, and has offered her service to the United States government. She has been informed by the Adjutant General of the United States that as soon as women are accepted in the government's aviation department she will be notified. 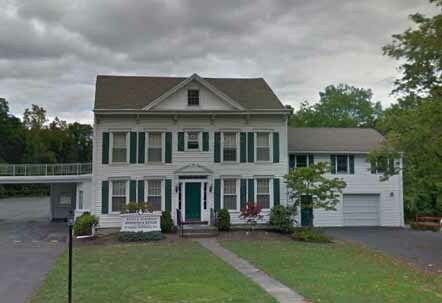 Census records indicate that Judge Milton M. Hall and his family lived at 110 Green Street, in the house that is now the location of Bates & Anderson Redmond & Keeler Funeral Services. The complete history of American ambulanciers in the Great War will never be satisfactorily told because a significant part of the record is incomplete: that involving the work of female volunteers. American women who drove ambulances in France usually got there by sheer force of their ability, ingenuity and resolve, and yet their extraordinary work is seldom treated in detail in either public or private accounts of the war. Still, sparse though the evidence may be many women did in fact swap their stateside lives for a term of ambulancing that was largely without exhilarating moments. 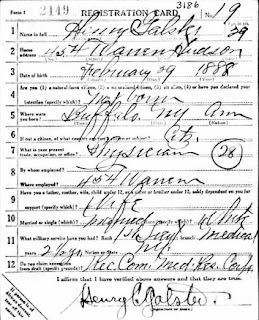 No evidence could be found about what Helen Hall did during wartime, but the decennial census for 1920 lists Helen M. Hall, then 25, who was born in New York and whose father was also born in New York, as living in Oklahoma City with two other young women. 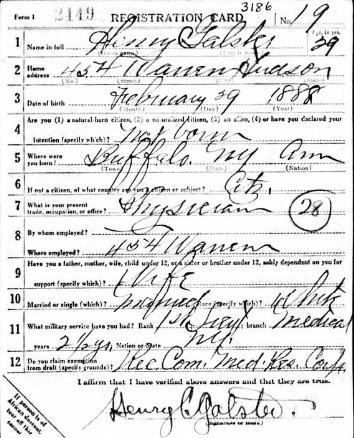 According to census records, Helen and one of her roommates, Ruth F. Harel, 24, from California, have the same illegible occupation in the same illegible industry. Ancestry.com transcribes their occupation as "Sec Tuburkhs" and the industry as "Asso," which makes no sense; whatever they did they were wage earners. It is likely while she was living in Oklahoma, working at whatever job she did, Helen Hall met her husband, Adolph Oliver Dovre, who was born in Minnesota, the son of Norwegian immigrants, and worked as a geologist for Sun Oil Company in Oklahoma. They were married in 1920 in Hudson, but sadly, the Hudson Register for 1920 is not available at FultonHistory.com, so an account of their wedding, which surely must have appeared in the newspaper, has not been found. In the early years of their marriage, Adolph Dovre worked in the oilfields of Venezuela, and a couple of times in 1921, the Columbia Republican and the Chatham Courier noted that Mr. and Mrs. Adolph O. Dovre of Venezuela were visiting various friends and relatives in Hudson and Columbia County. By 1930, Helen and Adolph Dovre had settled in San Antonio, Texas, where they lived in this house on East Magnolia Avenue. 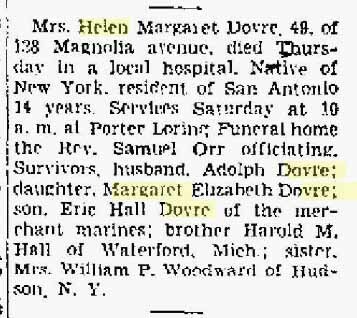 Helen Dovre died in 1943. Her death certificate gives the cause of death as "Generalized Carcinomatosis." 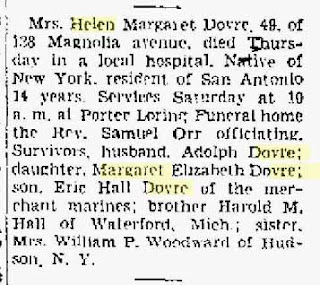 Her obituary, which appeared in the San Antonio Light on September 24, 1943, doesn't give many clues about her life. The obituary that appeared the same day in the Hudson Evening Register provides a bit more information. Adolph Dovre survived his wife by eight years and died in May 1951 at the age of 57.
Who Said All Publicity Is Good Publicity? "What Is so Rare as a Day in June?"